Convention season is upon us and I hope all my fellow geeks out there have at least one fun con in which to romp. I am geeking out in a major way, spending two consecutive weekends at three conventions. Over the Memorial Day holiday weekend, I headed to San Jose for the joint conventions, Fanime and Clockwork Alchemy. I have to shout this out to San Francisco Bay Area folks who aren’t in the know. For a $50 preregistration fee, you can spend four days at two conventions. It’s an incredible value and tons of fun. Fanime is all things anime and manga, as well as a bit of Asian cinema thrown in. The attendees love to cosplay, i.e., dress in the costumes of their favorite characters. It’s like a four-day costume party that goes all day and all night. Just so you know, this is a very young crowd and the majority tends to be in their teen and twenties. There’s a lot going on: video rooms, panel discussions, live bands, karaoke, swap meets and a 24-hour game room. There is a large dealers’ room where you can buy all kinds of anime-related paraphernalia. This year, the Artists’ Alley was enormous. This is where you can buy creative pieces by talented fan artists. Clockwork Alchemy is all things steampunk. If you love Tesla and Jules Verne, this is where you want to be. The crowd is more mixed, with younger and middle-aged folks mingling equally. If you like the technical and/or historical side of the genre, there were plenty of informative panels as well as an art gallery and hands-on exhibit. There was an authors’ salon where writers could attend panels hosted by published genre authors. The convention also included a dealers’ room, a martial arts studio, dance lessons and three nights of live performances. Steampunk fans love to cosplay, too. I got into the spirit and put on some steamy duds. Huge dioramas were placed around the con for posing purposes. Oh the humanity! I watch in thrilled horror as zeppelins battle above me. Photo credit: hostess with the mostest Susan. This coming weekend, I will be attending Denver’s Comic Con. Can’t wait for that, though I’m glad I have a few days to rest up before I get my con on again. Does this all look and sound like a lot of fun? Well, it is! And you can do it, too. Check out this website, Upcoming Cons, for current information on upcoming conventions. I’ll be getting my geek on this weekend and attending Denver Comic Con. This got me interested in checking out what kind of graphic novels are available for the Kindle, particularly freebies, of course. It seemed to me that E ink display technology is perfect for a gray scale medium like comics, particularly manga. My limited research led me to discover that E ink Kindles such as my Touch are great for manga. I downloaded a $0.99 cheapie, BUT I’M A MAID! Episode 1, and a freebie, Chapter 9: SIN. Both look good on the screen, though the fonts are a little small and can’t be re-sized. That’s the good news. The not-so-good news is that there aren’t many freebies available for E inkers like me. There are a number of free graphic novels, but these can only be viewed on the Fire, or through an iPad or Android app. They can also be viewed through Amazon’s cloud reader, but to me, that defeats the purpose of having an eReader. If you’re interested in looking into graphic novels for the Kindle and apps, free or paid, you can find the Amazon bestsellers here. I also picked up some fiction, travel guides, a graphic design magazine, and a guide to getting free software. I’m a bit dubious about this last one, so let the freebie buyer beware. By free, the author means alternatives to Microsoft and Adobe. Don’t know about that. It’s hard to believe there’s free software compatible and comparable with Photoshop, but I’ll take a look. Whether you plan to geek out, get out or just relax with your Kindle and a cold drink, enjoy your weekend! Brett Bradbury’s parents are dead, her boyfriend’s a cheater, and her best friend essentially dumped her. Truly alone in the world, Brett agrees to help colonize the newly discovered planet, Verita. Now Brett’s on a strange new world. She quickly makes friends and starts her assigned job. Verita begins to feel like home, but it’s far from perfect. Brett has an overwhelming attraction to Brody, despite the fact that he’s entirely not her type. Her colleague, Ryan, utterly hates her for reasons out of her control. And there are creatures in the forest that would like nothing more than to devour everyone for dinner. In Newcity, everyone is content. Bad feelings are not allowed, because your monitoring chip will alert the police to bring you in for treatment. Getting better is mandatory. Unchecked emotions made the world outside Newcity dangerous, unruly, and violent. At least that’s the official story in Newcity. Keith knows something is wrong. Strange visions lead him to become one of the few who escapes Newcity. He finds freedom and companionship outside, but pressure building to revolt against the city’s insidious regime of social control. Leadership is thrust upon him, with only his visions for guidance, only a small band of friends for support—and the fates of both Newcity and the outside world at stake. Faye Longchamp has lost nearly everything except for her quick mind and a grim determination to hang onto her ancestral home, Joyeuse, a moldering plantation hidden along the Florida coast. No one knows how Faye’s great-great-grandmother Cally, a newly freed slave barely out of her teens, came to own Joyeuse in the aftermath of the Civil War. No one knows how her descendants hung onto it through Reconstruction, world wars, the Depression, and Jim Crow, but Faye has inherited the island plantation—and the family tenacity. When the property taxes rise beyond her means, she sets out to save Joyeuse by digging for artifacts on her property and the surrounding National Wildlife Refuge and selling them on the black market. A tiny bit of that dead glory would pay a year’s taxes. A big valuable chunk of the past would save her home forever. But instead of potsherds and arrowheads, she uncovers a woman’s shattered skull, a Jackie Kennedy-style earring nestled against its bony cheek. This eBook is Smashing Magazine’s humble gift to all of your for your support, criticism and encouragement over all these years. It contains best — most useful, most interesting or most inspiring — articles that have been published on Smashing Magazine over the last five years. They have been carefully edited, proofread and updated for your convenience and a pleasing reading experience. Most computer users need a variety of software to handle tasks such as word processing, crunching numbers in a spreadsheet, handling their email, or managing personal finances. Other common activities include creating presenations, editing digital photos, updating a website, or installing security software. In this ebook, 30 of the most popular commercial software packages are listed, along with the retail price of each. If you were to purchase all of them, it would cost over $5200. But most people don’t know the valuable secret you’re about to learn… there are excellent, FREE alternatives to ALL of these popular programs! If you’re still paying big bucks for your software, you absolutely need this information. Everyone looks forward to their summer vacation, but with the economy still in such a poor state, a lot of people may be asking if they can even afford one. The secret is to start planning early in order to get great bargains on summer travel destinations, package vacations and holidays. Top ten itinerary in Rome. 10 sites not to miss. This booklet gives you everything you need to get by for a short trip to China. It gives you all of the following: the 10 Most Useful Phrases for a Newcomer; In a Hotel – the language you will need to book and stay in a hotel; Days & Dates – absolutely everything necessary for booking (days, months, dates, numbers & counting). I have attended Fanime, an anime convention in San Jose, California, almost every Memorial Day weekend for the past 12 years. Why would I do such a thing? Because it’s fun! It’s like being in the middle of a huge costume party that runs nonstop for four days. And I like anime, so going to the convention helps me keep up with what’s new and exciting. This year, I found a new anime to watch called “Tiger and Bunny.” I know. Sounds like something fluffy and light, but it’s actually a superhero story, and it looks pretty good. I found a beautiful online manga called “Knite.” Can’t wait to see more of that. And I watched a touching movie called, “Sunny,” about seven Koren schoolgirls and the women they become. In-between, I strolled Artists’ Alley, where talented artists sell their work. Some of the art is specific to a particular fandom, while other artists sell their own work, usually drawn in the style of manga, Japanese comics. 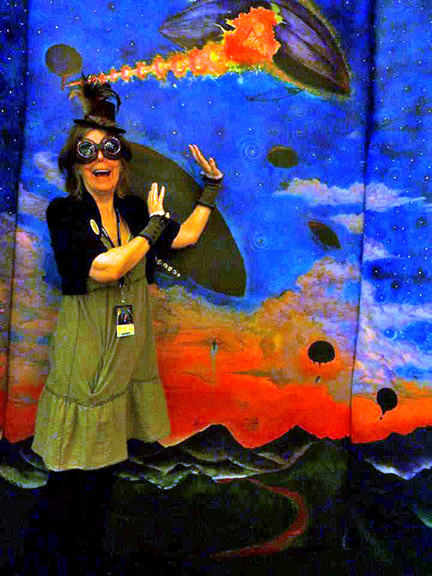 I also spent some time at Clockwork Alchemy, the steampunk sister convention to Fanime. One ticket got you into both conventions, with free shuttles running between both venues 24 hours a day. Sweet. 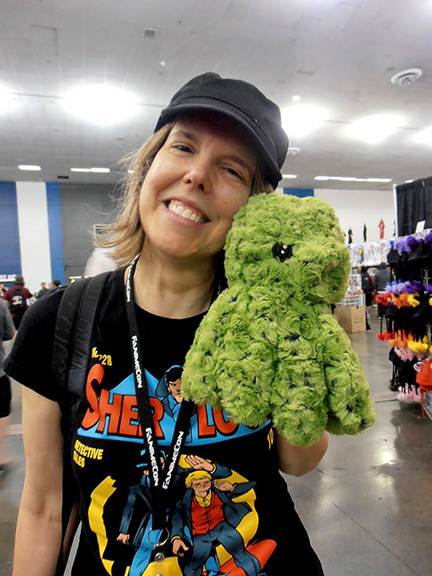 A special shout-out goes to my friend, Jennifer, who attends this glorious geekfest with me every year. We do have fun. Do I dress up? Not really. Not unless you count wearing cat ears and a Sherlock T-shirt as dressing up (I don’t.) However, I love seeing the people who cosplay (i.e., wear costumes.) Most people make their own costumes and they are incredibly creative. Think about it. They don’t have patterns. They are making costumes based on reading a comic or watching an animation.That can’t be easy. The front of the convention center was packed from morning to evening with cosplayers posing for photos. It’s a lot of fun to take pictures. Above are some of my favorite photos from this year’s convention. Next year, where will I geek out: Fanime or Eurovision? San Jose or Stockholm? It’s a big decision. We’ll see which one I choose.